Look at the inside of the bag! 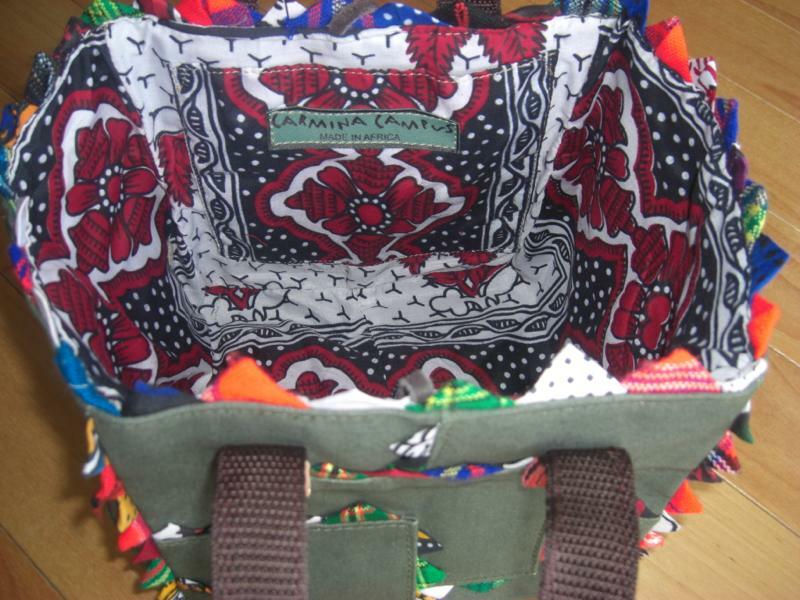 The lining is also made of African women’s dresses. The olive green cloth used to be a grain sack. It was dyed dark green. The buckles of the handles used to be color samples of a leather manufacturing company. That’s why you can see numbers on the buckles. 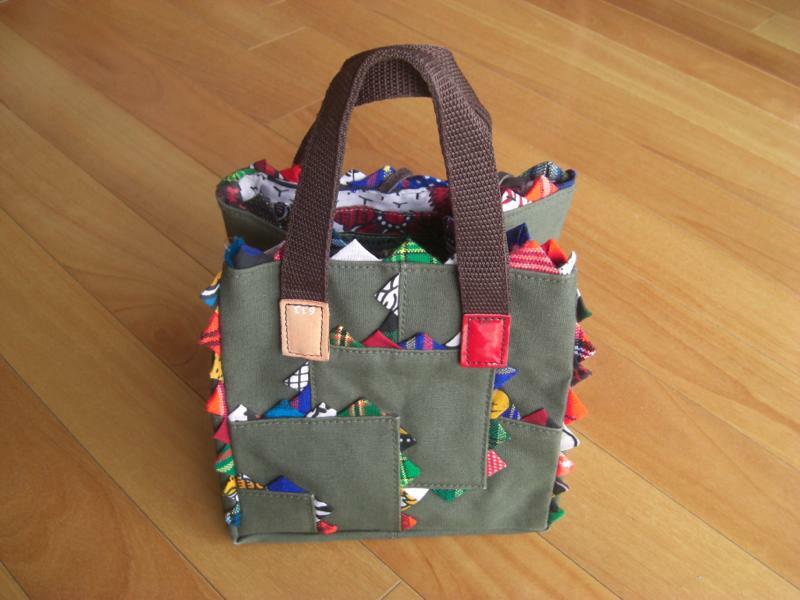 Thus, all the parts of the bag are made of second-hand material, UP-cycled into such a lovely bag. 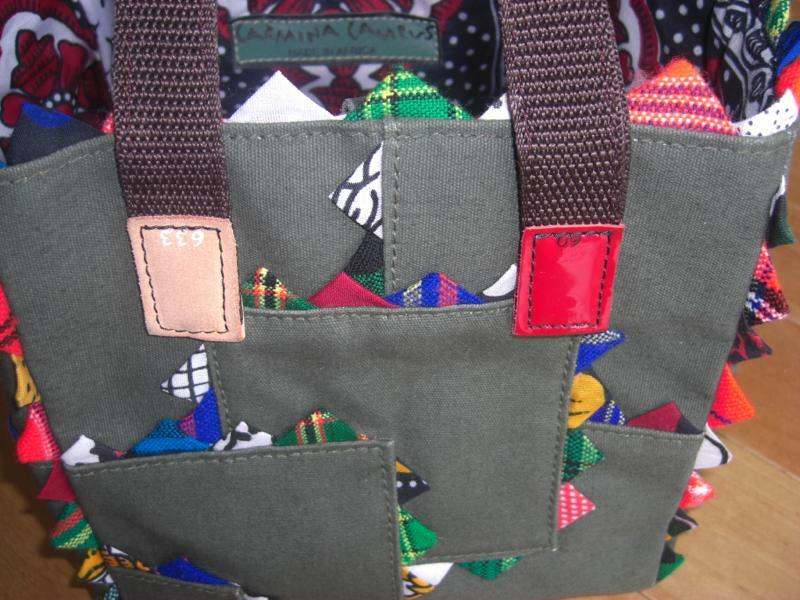 This bag is a recycled, no, UP-cycled product made by Kenyan women. 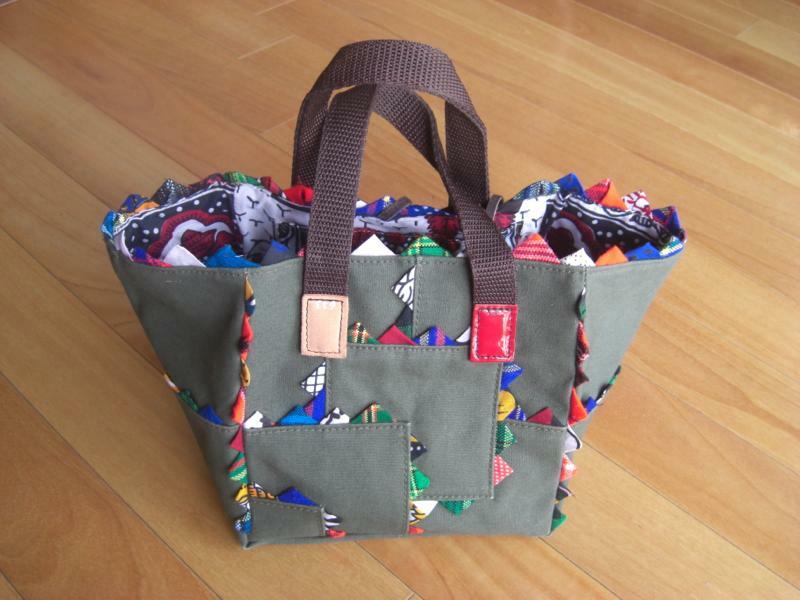 The elaborate design of the bag, which is decorated with small triangular frills and square leather buckles in different colors, requires a lot of manual labor. In other words, a lot of women are needed in order to complete one bag. The decorative design can create more employment opportunities for women than just a simple one. This sophisticated and labor-intensive design was created by an Italian designer. This business was launched by the International Trade Center (ITC), which is one of the United Nations’ organizations. It has implemented a project called “Ethical Fashion Initiative,” with an objective to achieve women’s economic empowerment by creating decent employment for women in developing countries (Kenya, Ghana, and Haiti). ITC provides skill training for women, and also connects marginalized women in Kenya, Ghana, and Haiti with the fashion businesses in Europe and Japan. The slogan of the Ethical Fashion Initiative project is “Not Charity, Just Work.” ITC is providing technical support for women so that they can make money not at a “survival” level but at a “decent” level, which is worth their work. If you want to know more about the ITC Ethical Fashion Initiative projects, click here!